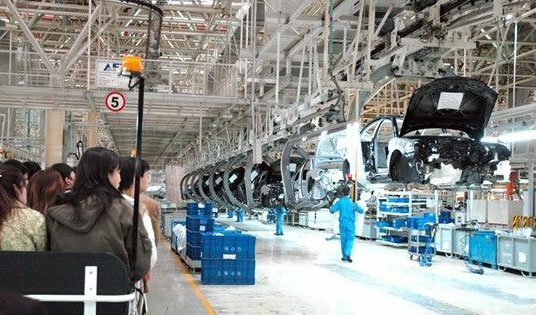 This industry tour is cool for vehicle enthusiasts wishing to have a close look at production line Volkswagen&apos;s Shanghai factory. The visit time usually lasts about 1 1/2 hours. Your guide will meet you in your hotel in Shanghai downtown and the driver will drive you to Shanghai Volkswagen Industry Area which takes 45 minutes. Commencing at the reception center you will then proceed to the exhibition hall to see the cars produced by Volkswagen. Then on to the assembly workshop to see cars turned from the raw materials to completed article on the production line. You will have a lunch there. After a short rest, your guide will take you to Shanghai Auto Museum which is very near Volkswagen Industry Area. The museum displays up to 70 classic cars covering the history of the auto history. 1. All reservation should be made at least 7 days ahead of your tour date. If your group is less than 10 people, the confirmation of the availability can only be made two weeks ahead of your tour date. 2. The visit to Volkswagen Industry lasts 45 minutes every time and is available from 0900 - 1500 on weekdays (Monday - Friday). 3. An English-speaking guide is also provided from Volkswagen Industry when visiting the factory. 4. Shanghai Auto Museum is closed every Monday. This tour does not include an audio guide device with English language in the museum. You can rent one at 20 Yuan when getting there. 5. The tour package is only available to groups which consist of 10 people or more.